Like many people, we’re having a family BBQ tomorrow so we can hang out, grill some meat, and have a few drinks together. We were contemplating what cocktail would make a good match for typical cook-out foods, and we thought something fruity and refreshing would fit the bill. We decided to go with watermelon, that backyard picnic staple, for a fruit base, liven it up with some gin, lime, and bitters, then make the whole thing fizzy and delicious with a touch of sparkling wine. Shake first 5 ingredients with ice. Strain into a champagne flute. Top with sparkling wine. Nose: Watermelon, rose, blackberries, lime. We plan to enjoy these alongside grilled Kalbi, potato salad, peach cobbler, and other end-of-summer deliciousness tomorrow. We hope you’ll give them a whirl for your festivities as well. Cheers! 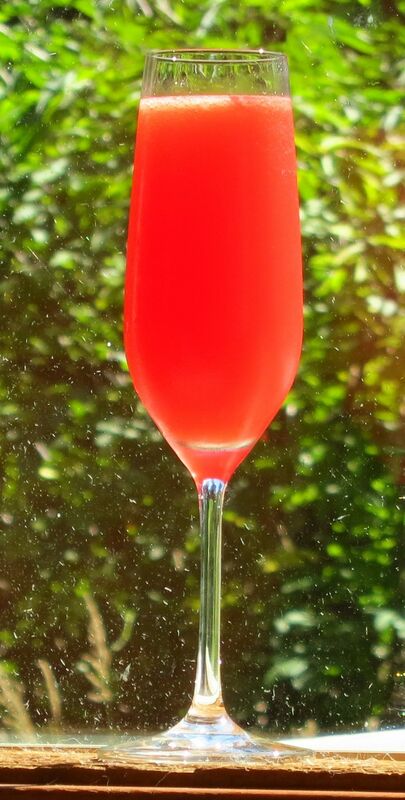 This entry was posted in cherry liqueur, gin, Original Cocktail, sparkling wine, watermelon and tagged harmonious cocktail recipe, Sparkling wine cocktail recipe, spy hop gin, watermelon. Bookmark the permalink.